The closer I got, the more the freezing air crackled with electric anticipation. My destination was the Wild Buffalo – more specifically, the Snoop Dogg show – and as I reached into my pocket for one of the most sought-after tickets in Bellingham’s concert history, my lungs were warmed by that singular, herbal scent so closely associated with the headliner. By the time I stepped inside and elbowed my way to the bar for a whiskey I had missed what’s been universally panned as a terrible set by Money Gang as well as a terrific job by DJ Boombox. I did, however, get there in time to see a low-energy Kokane punch the clock for 30 minutes, doing just enough to collect his paycheck. That was a real disappointment, considering Kokane’s extensive writing credits include NWA, E-40, and others. Around 11:30, the hype man started jumpin’ around everywhere asking folks if they were excited to see Snoop and waited for us to scream our approval. Thirty minutes later he was still at it, scraping the bottom corners of his call-and-response material by asking everyone to shout what high school they went to. The whole thing began to reek of a no-show by Snoop and the nervousness in the crowd was tangible. The Buff had come through by booking a major artist and I began to wonder if we weren’t getting big-timed by a superstar that couldn’t be bothered to stop in between Seattle and Vancouver. Those fears were soon assuaged by the familiar lodi-dodi-daa’s wafting through the air like a smoky exhale, a unique heralding of the legendary MC’s pending arrival. 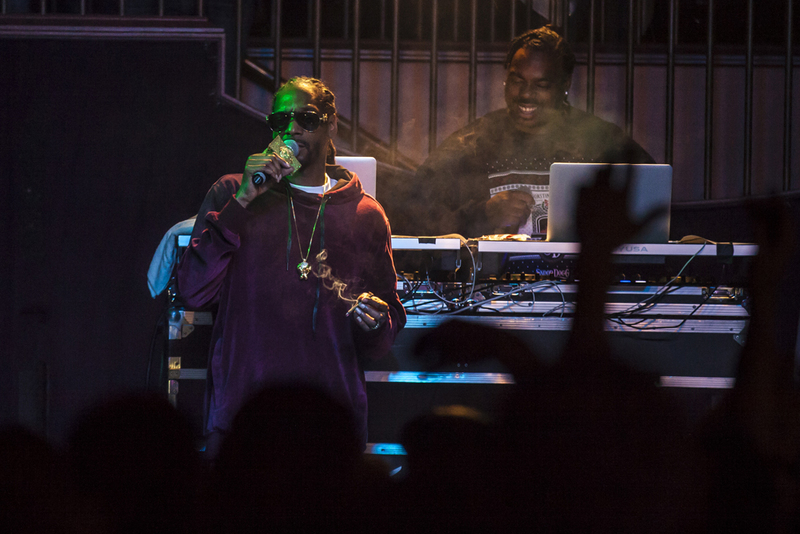 That welcome lilt was followed 60 minutes of Snoop Dogg performing in Bellingham. I had worried whether he’d forego the classic, genre-tilting material we all loved in favor of his more recent anamorphic material but he led off with a triumvirate of classic bangers including the aforementioned intro verse to Next Episode, Nuthin’ But A G Thang, and Gin ‘n Juice. When Snoop did mix in his newer and more Rastafarian-inspired jams, the whole club was so elevated off our contact high that we floated right along with him. And despite his DJ smashing the air-horn sound-effect into non-existence every three minutes, Snoop never pretended that we were there for anything other than to watch an icon do what made him iconic. Track after track, the Doggfather kept that block-party hip-hop vibe front and center, shoulder-shrugging his way through an increasing cloud of smoke until he made his triumphant exit. At thrice the price of the Wild Buffalo’s previous most-expensive ticket, and knowing that tix were re-selling for thrice that price, I was dubious as to whether I’d get my money’s worth. And yet, I left the joint feeling like I got a steal. Finally, I’ve got to tip my proverbial cap to Craig and Joey and everyone involved with booking Snoop and I hope the success of the show helps bring more acts like him to Bellingham. Jerns began the evening with a brief hello before quietly launching into the first set, a solo performance memorable as much for Jerns’s commanding presence as it was for the music’s gradual swells and probing, intent moments of dissonance. After a break, Jerns returned to the stage, this time joined by frequent collaborator Matthew Curtis, who provided texture and ambiance on guitar, and Maia and James Schaberg, whose sweeping dance performance brought a sense of buoyancy to the night’s proceedings. After a second break, Jerns and Curtis were joined by Kevin Wharton on bass, Mark Detrick on guitar, and Ryan Wapnowski on sax. The group played with a relaxed trust and attentiveness, building a sound that was equal parts expansive and subdued, bringing to show a gradual crescendo over the 25-minute set. Providing a backdrop to the performance was a visual collage of photographs by Curtis. The selection and composition of images offered a clear parallel to the music – eliciting a character lonely and searching on the one hand, but wholly at peace on the other. In the soundscape that is Pan Pan, moments of quiet introspection are neither regrettable nor to be avoided, but rather familiar, warm, inviting – and above all, to be shared with others. And as the content of the images slowly shifted from sparse, unoccupied interiors to the sprawling, open exteriors of the Pacific Northwest, the question of rooms slowly circled around an answer. It’s not the places in which we find ourselves, but how we choose to occupy the space – how in every room we inevitably leave a part of ourselves, but only so we can take more of the world in as we go. Listen to Pan Pan’s Rooms on Bandcamp at panpan.bandcamp.com. Locals Vacationeer and The Sky Colony sandwiched Seattle comers INGS on a slightly subdued night of excitement at The Shakedown Saturday, Dec. 4. The crowd was early for Bellingham band Vacationeer. I learned that this show would be the last for the two-piece made up of Jase Ihler and Nikko Van Wyck before Jase moved to Seattle and although it doesn’t mean the end of Vacationeer (they debuted a new song! ), the mood in the room was bittersweet. Post-rock sensibilities met synthy indie pop to create an ambient, groovy sound. Typically in this genre, vocals aren’t really heavy, if present at all, but Vacationeer strays away from that in a way that I thought worked. The delivery was reminiscent of spoken word; building, haunting choruses broke to soft whispers and trailed off in my head even after the song had finished. Vacationeer adheres to traditional song structures while taking risks in their blend of wistful synth pop and post rock. I found myself wanting a heavy breakdown of sorts, but settled for dreamy tension instead. The band premiered a new song that had such pop punk vocal tenacity I nearly expected the whole audience to jump in singing at any moment. I suspect that they will, given a few more performances. The duo bantered about new beginnings as they parted and left their audience on a positive note. The crowd dispersed quietly. Everyone stuck around and even more people showed for Seattle’s INGS. The amount of people that shuffled to the front for this stage first surprised me; usually the band has to earn their front row crowd at an out of town show. But then, INGS began, and I became one of those shufflers. The four-piece is fronted by Inge Chiles, a woman dwarfed by her Stratocaster and absolutely shining in her blue sequin and tulle party dress. Singing songs about self-respect, Slaughterhouse V, feigning niceness, and some people’s inability to take hints, INGS stole my heart, and stole this show. I was reminded of Regina Spektor, Sally Ford and The Sound Outside, with a touch of Feist. Inge’s acrobatic voice did flips high above surfy strums and Ray Manzarek inspired key solos in songs that unfolded incredibly organically and were busting at the seams with sentiment. Their platonic love song celebrating best friends pulled several cheers around the bar and their cover of The Beach Boy’s “Surfer Girl” was the cherry atop this darling set. Although INGS is self-described as “Lullaby Rock,” and although unendingly dreamy, I’d classify INGS as “50’s High School Slow Dance Rock” and will definitely be seeking out their music online. Closing out the night was four piece self-described “Dream Folk” locals The Sky Colony. Although I did not stay until the very end, I was definitely rapt. The band has an undeniable pastoral quality: a sincere approach to no-fuss, quality folk that romanticizes country living. Since the last time I saw The Sky Colony, their lineup has changed a bit to include a stand-up bass player. Additionally, the band traded in a bit more electric guitar where violin used to be. Although they lost a great voice among the members, the group has an impeccable hold on their harmonies and I think this is the best I have ever seen of The Sky Colony. It’s always fun to experience a myriad of genres in one bill, and The Shakedown is expert at providing us with cohesive, yet diverse bills that have us googling the Bandcamps of groups we’d never seen before. This night was a perfect example of that. The Shakedown was the second stop on Wolvhammer and Atriarch’s Desanctifying North America (Part 2; The Sequel, now with more desanctification) Tour. And I’ve been so stoked since it was announced. Seattle band Hissing opened. They’re a three piece, featuring Bellingham dude Zach Wise on bass/vocals. Blending elements of black metal, heavy as balls moments of doom, and sometimes just pure punked out thrash I was made into a fan by their set. They were selling cassettes and you should check them out on bandcamp. Caught somewhere between death rock and doom metal, Portland band Atriarch was up next. Atypical of metal bands, the vocals sound like a reverbed out David Vanian (circa Phantasmagoria) and screaming is much less common, making it all the more epic when it comes out. Honestly, though I was a pretty big fan of An Unending Pathway I wasn’t as into their set as I thought I’d be. I came for Atriarch and could’ve gone to bed early, but I stayed and watched Wolvhammer. I was glad I did because they were easily the best band of the night. The vocals were killer, there was never a dull moment in their music. There was more of a punk sensibility to their doom metal, and while Atriarch felt meandering at times there was always purpose to their blackened death rock/metal/punx. The melodic moments were beautiful; never tedious, and when it was brutal, it was brutal. This was my second time seeing both Slow Magic and Giraffage, but I had high hopes about what was in store for the night, especially at a venue as intimate as the Wild Buffalo. Arriving about 10 minutes into the opener’s set, I had to wait in a surprisingly long line for how early in the night it was, but it was a sold out show and many people were visibly excited. Once inside the doors, many attendees were dressed in rave-like dancing attire, including fur animal hoods and several people were wearing versions of Slow Magic’s electroluminescent mask. For the show being held on the Tuesday of finals week, the dance floor was already jammed full of college-aged attendees. The opener, Lindsay Lowend, was a DJ set, mixing electronic dance music with 90s-style pop songs, that generated high expectations for the night. When Lindsay Lowend sampled Genuwine’s “Pony” everyone – including the bartenders – in the Buff was dancing, even though it was only 9:30. To my surprise, Slow Magic took the stage next, starting off slow and melancholy, and swooping in euphorically with powerful live drumming. The whole floor shook to the beat of the song, as everyone danced to the mash up of live drums and electronic music. I soon found myself in the middle of the dance floor; everyone swayed and bobbed together, a few people got overexcited and spilled their drinks, including the guy right in front of me. Slow Magic started out with his popular tracks like “Still Life” and “Waited 4 U.” He interacted with the audience, standing on top of speakers, holding up his drum and even venturing out into the crowd during his hit “Girls.” The colorful light up wolf/fox/zebra mask that Slow Magic wears to conceal his identity had me mesmerized during the entire set. Giraffage was the final act, and while he did not disappoint I noticed the crowd was visibly smaller. His DJ set provided less energetic, but still very dancey vibes. Most notable was Giraffage’s visuals—emojis, gorillas, kittens and landscapes flashing on screen as multicolored lights poured over the audience. Even though the music was enjoyable, I wish he had interacted with the crowd more instead of just standing behind his laptop. The whole floor was dancing during his mix of Drake’s “Hotline Bling” while a cartoon image of Drake crying emoji tears played on the screen behind him. The colorful lights traveled across the dance floor as everyone sang and danced along to his poppy, dancey sounds. I left the Wild Buffalo sweaty and with sticky shoes, but smiling from a night spent dancing to great live music. Owner Hollie Huthman celebrated her birthday with a rocking line up of Bellingham’s The Crawl and Seattle’s own, Wild Powwers and Helms Alee, on Dec. 12. The venue quickly started to fill even before anyone had taken the stage that evening and this is always a great sign of a fun night to come. The Crawl hit the stage first with a tight set. With little to no banter, a lot of great music and also free merch the band did a wonderful job starting the night off. Something I’ve noticed upon multiple viewings of this band is how each musician gets incredibly involved with what they’re doing on stage. They’re completely enveloped by their parts and are great to watch while they’re performing. The Crawl’s noisy, industrial and rock music grooves a ton. Most of their set contained very mid-tempo but technical songs and it was great to hear how they layered polyrhythms into their music. They’re still a relatively new band but the foundation that they have leaves me highly anticipating how they will grow and makes me look forward to seeing them again. Wild Powwers (formerly Powwers) were up next and kept the night going strong. By this point in the evening I always find it a make or break point. The support is either going to keep me engaged or desperately make me want the headliner to go one but Wild Powwers did not disappoint. They were energetic and it was pretty obvious to see how they are very talented performers. This trio played a wonderful set of grungy but also psychedelic rock. Something I enjoyed in particular was how vocalist, Lara Hilgeman’s voice melodically floated upon heavily distorted guitar and bass. The band did know how to bring the heaviness down though and delivered a good variety of slower and more moody songs that fit very well with the rest of their music. Finishing off the night was Helm’s Alee. Upon reflecting on this show, the whole night was more than a gift for Huthman but for all of the attendees because Helms Alee closed everything off with a huge wall of distortion and sound as they do so very well. It never ceases to amaze me on how gigantic this trio sounds and it’s always a treat to bang my head to their sludgy and heavy music. They played a great mix of their music that would satisfy any Helms Alee fan. Their set was incredibly tight and enjoyable. They even took time to sing happy birthday to Hollie which was incredibly heartwarming. After a little over an hour of music they finished off their set and left me and I’m sure many other people wanting more. A group sat shoulder to shoulder on the extended bench in the dimly lit Swillery downtown looking up at the bright projection of Mario Cart on the opposing wall. Below the colored streams of light beaming from the projector, Greg Hughes of Seattle set up to play a solo version of his full outfit Bobby’s Oar. “Hi I’m Greg,” he announced shyly into the mic and stepped away. Sudden, powerful strums rang out from his acoustic guitar as he shouted the words to his opening song giving Mario Cart players pause and perking the interest of the others in the bar. An Orlando native, Hughes sings expertly about picking up to move across the country settling in Seattle – a place that couldn’t hold more differences from Florida. I spoke with Greg briefly before his set about hurricanes, the Pacific Northwest rain and lastly alligators. “When I moved to Seattle I wouldn’t swim in Greenlake,” he said with a laugh, simply because Floridians have to worry about what kind of creatures may lurk in the water. Hughes’ folky-punk vocals along with his sporadic, proficient guitar playing make for an energetic sound. Often swerving between slow to speedy finger plucking riffs and melodic powerful strumming, the ebb and flow of each song compliments the emotions conveyed within his lyrics. Particularly when discussing the hardships of feeling stagnant in life and relationships and desperately seeking change. Aaron Kayser’s impromptu bass riffs which change from each performance continually add something new to each song while drummer Aaron Apple’s powerful loud bass beats rang out prominently atop the melodic strums. Having been featured in the most recent Bellingham SoundCheck, the group has also began recording their first full-length album with Eric Wallace at Champion Street Sound Studios here in Bellingham to be released in 2016. Stay tuned! Last to perform was local duo STFU Robot. Despite the waning crowd, Brendan Silk and Charlie Walentiny were unwavering in their signature brand of satirical bro rock. Along with playing their classics “Lamaze Class” and “Drunk Pics” they pair performed a theatrical – and probably the lengthiest version I had ever heard—of Foghat’s “Slow Ride” for well over 10 minutes. While some of the newcomers in Bellingham were confused by the set, those who knew the band personally could not help but laugh, particularly when Walentiny pulled his guitar over his shoulder to rest it on top of the bass, playing the two of them simultaneously. I pretty much lost it when Silk left his drum set to stand behind Charlie and do some alternating strumming between the bass and electric guitar. Be on the lookout for more side projects featuring these two characters in the near future.